I went from having 0 Hyaluronic Acid to having 3! How exciting! It seems to be a little much all at one time, but I'm glad because now I can compare all 3 and decide which one I really like the best. 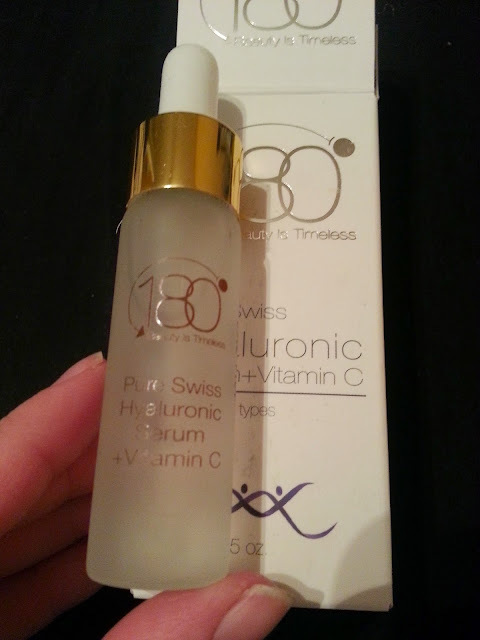 This time I will be reviewing 180 Cosmetics Pure Swiss Hyaluronic Serum + Vitamin C. I have to say that I received this product for free in exchange for my honest review - which I will be sharing with you all. When I first saw that this was pure Hyaluronic Acid I was excited to give this a try. I was also happy to see that it was high up in the ingredient list, which means its one of the more "stronger" ingredients inside. I like that because others claim they use, or are, hyaluronic acid, yet its at the bottom of their ingredient list with others listed above it. I do have to say though, this bottle was a lot smaller than what I was expecting. It's only 15mL (or 0.5oz) and most serums are 1oz. I get that only a little needs to be used, but it's a little pricey ($14.45 on their site) especially when other serums again, are bigger for the same price, or a few dollars more. Out of the three hyaluronic acid's I have tried, this one was probably the bottom of the three. Although my skin did feel hydrated, it also made my skin a lot more flakey. I was getting a lot of dry skin on my forehead and my nose, and no matter how much serum, or moisturizing cream I applied, it wasn't going away. The serum also gave me a few breakouts which I'm still trying to get rid of. I probably wouldn't purchase this brand again because it didn't really work positively for me. But, everybody has different skin types. So although this didn't work the way I wanted to for me, it may work for somebody else. It's all about trial and error and seeing what works best for you.